Here’s a quick peak into what’s in store for Atlanta’s luxury home market this year. In many markets over the past few years, there’s been a trend towards smaller homes. And while less pronounced, this trend has even found its way into the luxury market. Interestingly, the biggest factor driving this trend isn’t so much the “size” of a home (although that does play a role) but more so a desire for a more efficient use of space. Homeowners have been moving away from large “useless” spaces towards floorplans that offer more efficient space that can be utilized in different ways. Rooms that are generally only used a few times a year are increasingly being seen as optional (think formal dining rooms). This trend has been evolving for several years now and can be seen most predominantly in kitchens. During this time, we’ve seen a shift in where families spend time together and entertain. Where for decades the living room fulfilled this role, the kitchen has now taken over this function. Today, most homes are designed around a kitchen that flows seamlessly into the living room. Breakfast nooks and space for kitchen tables will continue to become less relevant and we’ll see that space disappear or be utilized for different functions. As open floor plans that allow for more functionality become increasingly commonplace, we believe the kitchen will continue to be the centerpiece of the home. With this in mind we’ve begun to see homeowners look for ways to keep that work space neat and clutter free. Larger pantries where preparation can take place, and small appliances (like coffeemakers) can be stored, will become more commonplace. If there’s one thing Atlantans love it’s their outdoor space, and having some space outside is as important to homeowners as just about anything. Decks and backyard patios have always been a mainstay in Atlanta homes and we’ll continue to see them evolve by offering seamless access between the indoors and outdoors. 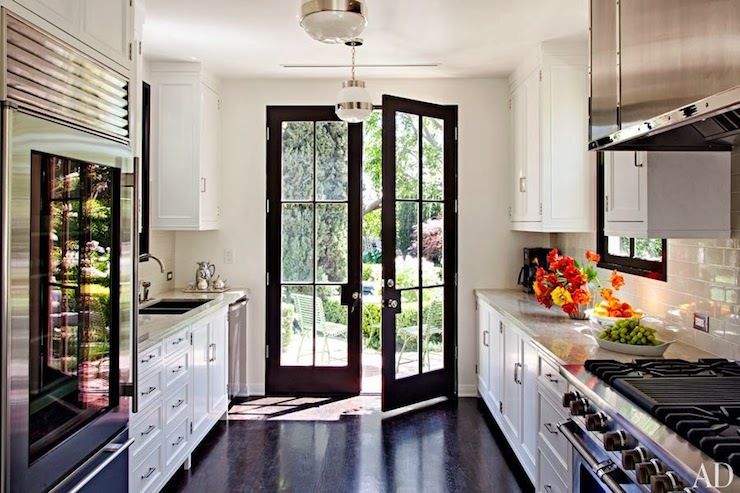 While popular for years in areas like Los Angeles and Phoenix, large glass doors that slide open to expose an entire wall are finally starting to become popular in the southeast. Atlanta was slower to embrace these popular features partially because of its wetter climate, but also because homeowners here tend to gravitate towards more traditional architecture. Although sliding glass doors don’t work well in every home, there are newer options coming onto the market that compliment Atlanta’s more traditional stylings – like Nanawall’s innovative solutions. Building materials continue to evolve and newer man-made products like Caesarstone and various porcelain and plastic composites that look a lot like wood are becoming increasingly popular. We will continue to see a wide array of different manufactured materials employed, especially as accents in bathrooms and kitchens. However, there has also been a strong move towards more traditional building materials such as natural stone (especially marble), stainless steel, and fine hardwoods. Perhaps one of the most interesting trends we’ll see in both home design and interior decorating is the incorporation of more copper and brass into features and accents. With the focus shifting from size towards efficiency, there’s been an increasing demand for high quality craftsmanship. Homeowners want luxury features to be integrated into their home in a way that feels organic and reflects a sense of place that will withstand the test of time. High-net-worth individuals are looking for beautiful fittings, the finest wood, stone, and fabrics, as well as rare and unique fixtures that enhance their living spaces. In keeping with the emphasis on unique materials and craftsmanship, luxury homeowners are looking to specifically tailor their homes around their unique tastes and lifestyles. While small-scale cocktail bars, built-in espresso makers and kitchenette’s in master bedrooms are fairly commonplace these days, we’ll begin to see these little “personalizations” expand into areas like lighting, home automation, and even bespoke closets that double as showrooms for their owners’ designer collections. Yep, we made our way back to kitchens again, and that’s because they’ll continue to be the focal point of homes in 2017. The high-end kitchen spaces found in luxury homes will once again focus on the finest materials and will continue to blur the line between residential and commercial grade appliances. Custom-made cabinets and exotic counter tops will continue to dominate kitchens this year, and we expect the trend towards painted cabinets to continue …although we’ll begin to see brighter colors being used. The beauty of the luxury market in Atlanta is that you never completely know what to expect. And with so many homeowners tailoring their homes to their own unique tastes, we can expect several new features to emerge that we never even imagined. 2017 will indeed be another wonderful year for Atlanta’s luxury home market.